Sony's new VRD-MC6 DVDirect is a new gadget and it looks and acts an awful lot like the previous VRD-MC10 and VRD-MC5. It can take 1080i video with 5.1 audio off your Handy cam’s drive or Memory Stick and shoot out an AVCHD DVD that plays back on compatible Blu-ray drives like the PS3. It can also transfer standard-definition home videos to DVD discs without the need of a computer from virtually any camcorder, VCR or digital video recorder. The new model includes Digital Video (i.LINK/FireWire/IEEE-1394), Composite Video inputs, and USB (for Sony hard drive, DVD and Memory Stick media-based Handycam camcorders). DVD video discs recorded in this manner are playable in most consumer DVD players. In addition, the VRD-MC6 can directly record digital photos to a DVD as a slideshow or just for photo storage from any of the four popular digital camera memory cards. 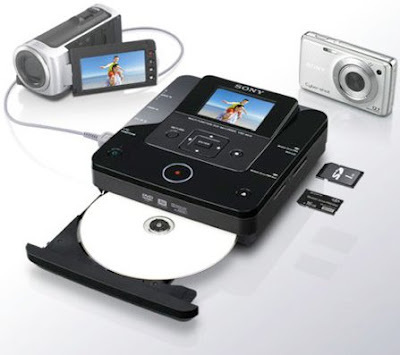 It supports slots for Memory Stick, Memory Stick Pro, Memory Stick Duo and Memory Stick Pro Duo media, Secure Digital (SD/SDHC) and xD-picture card™ media, or via USB from Sony hard drive, DVD and Memory Stick media based Handycam camcorders. The DVDirect VRD-MC6 will retail for around $229 at Sony Style stores and other major retailers around the country in September. Also: MC10 is still only available for NTSC (US & Jpan), not PAL-format (the rest of the world). Bummer. Suppose I buy a MC10 or a MC6 here in the US. I burn DVDs (HD format) and send them to my parents in Turkey (PSL, not NTSC, and different DVD Region). Would they be able to play it if they bought a Blu-Ray player over there?